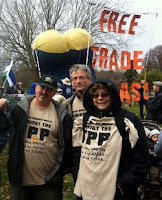 Alliance for Democracy Oregon members traveled by bus to the Peace Arch in Blaine WA on Dec 3, 2012 for a rally and summit with others opposing the TransPacific Partnership (TPP) from Washington state and from Canada. They joined friends from the Oregon Fair Trade Campaign and many unions in Oregon to make the trip. Here's AfD members Greg Magolis, David Delk (who is also chapter president and AfD's national co-chair) and Barbara Council. And yes, that is a giant posterior-shaped balloon hoisting a slogan into the air. All kidding aside, summit participants decided to get at least 1,000 organization sign-ons to a tri-party statement opposing the TPP. Negotiations for this deal have been carried on in secret, with even Congress locked out of the process. Lack of transparency is only one concern with the TPP--it has the potential to undermine democratically-determined laws on public health, "Buy American" compacts, and the environment. For more rally pictures (and a view of the Portland chapter in action this year) see this page on their website.